June 17 – It’s a real rave-up with The Sponge. Beat at it’s best! September 28 – This act is provacative! It’s daring! It’s exciting! You must see Malaika Mandes, clubland’s sensational snake dancer. October 14 – The M.D.E. Club’s Special Midnight Matinee. K.H.G. Rules plus The Hi-Steppin’ Damson Jam. 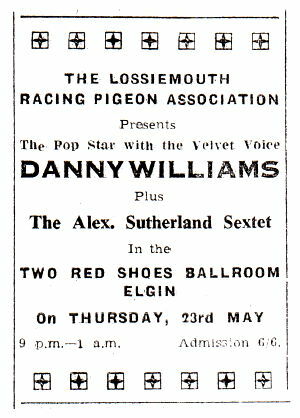 The contrast between The Two Red Shoes and The Ballerina Ballroom in Nairn is quite shocking. 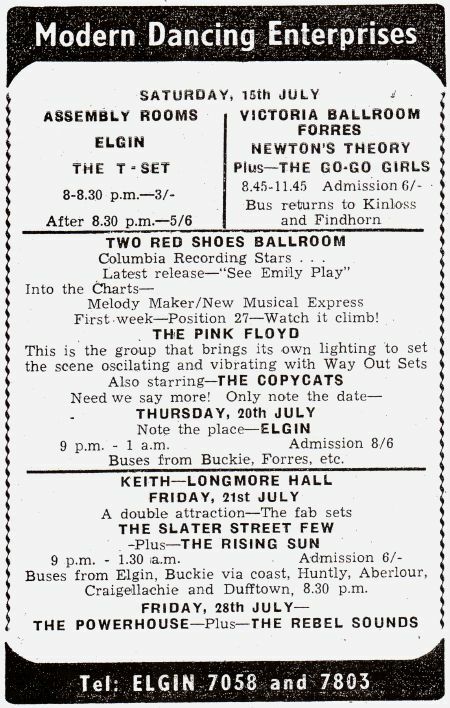 Only two big-name bands played Elgin in 1967 whereas at least 10 played Nairn. Why Bonici’s ballroom in the smaller of the two towns should have proved more successful at this period is a mystery. 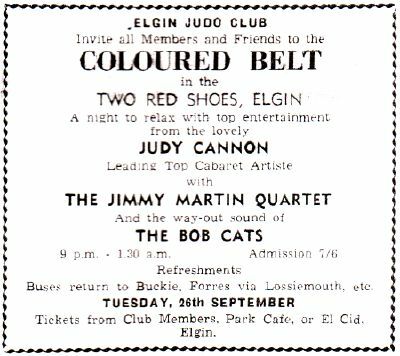 What is clear however, is that the Elgin venue had become boring and outdated. There was little change in the resident band although Bonici did have several bands circulating around his other dance halls. No matter how popular The Jimmy Martin Band was, it was crazy to have them play almost every night the venue was open. 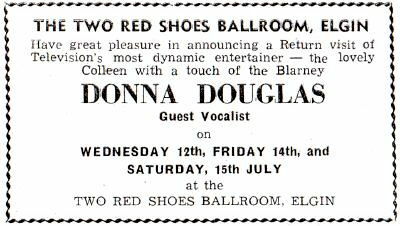 It seems the glory days were really over for The Two Red Shoes despite Pink Floyd playing on July 19th. I’m assuming their appearance was once again down to the relationship built up with Brian Epstein. It’s possible that Albert was contracually obliged to take them for a set number of dates. Wednesdays – Over 25’s Night 9.30 – 11.45 p.m.
Fridays – Late Night 9.30 p.m. – 1 a.m.
Saturdays – Palais Night 9 – 11.45 p.m.
July 20 – Pink Floyd plus The Copycats. I’ve been told that only 12 people attended this concert. The advert above is typical of Albert Bonici‘s over the top promotion skills. It turns out that the way-out lighting was provided by Graham Nairn who took charge of the Two Red Shoes Light(s) and tried to add some atmosphere to the event! To give you a taste of what Pink Floyd were like and what their way-out light show should have been like, here they are at the legendary UFO CLub in London from March of this year. The footage is from a German documentary film called Die Jungen Nachtwandler (The Young Nightcrawler), about the British musical scene in the sixties. The director Edmund Wolf also appears on the clip for a short comment. It’s fascinating as it shows how the audience reacted to the music as well as what it was like in a club at this time. The advert above is from the Northern Scot and the listing below is from the Elgin Courant. Why neither contains the others date(s) is anyone’s guess. November 28 – It’s the new Cash Boutique Queen. Heat 2. Win a fabulous nylon fur coat! January 03 – Elgin Jazz Club presents Midnite Holiday Dance. 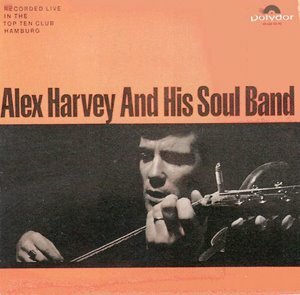 Music by The Alex. Sutherland Band with Alyson Armstrong. January 14 – Moray Dance Club presents Dave Berry And The Cruisers. Here’s Dave with Little Things which would hit the chart in March. 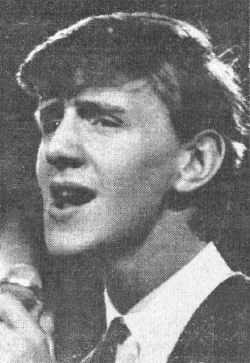 January 28 – SJPA presents Wayne Fontana And The Mindbenders with The Alex. Sutherland Sextet. 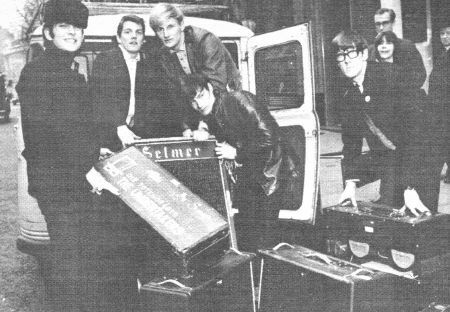 Here are Wayne and The Mindbenders performing “Game Of Love” which will enter the chart next week and hit the number two spot and “Just A Little Bit Too Late”. March 11 – The Swinging Blue Jeans, seen above with “Shake, Rattle And Roll” and “Good Golly, Miss Molly” from last year’s NME Pollwinners Concert. September 23 – Elgin Jazz Club presents The Toggery Five plus The Groundhogs. 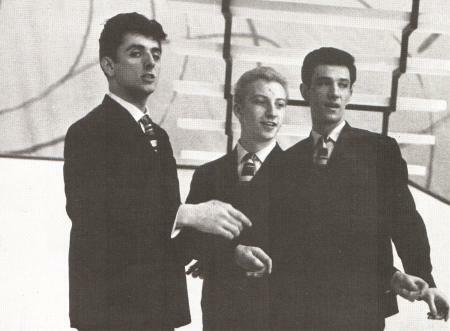 The Toggery Five were a Manchester band named after a clothes shop in Southport. They only released two singles. This, their second, “I’d Much Rather Be With The Boys”, was written by Andrew Loog Oldham and Keith Richards. October 12 – Moray Dance Club presents The Ivy League, seen here with their number 8 hit from earlier this year, “Funny How Love Can Be”. November 09 – SJP Association present The Nashville Teens, seen above performing “Tobacco Road” on the U.S. TV show, Shindig! back in March. The resident band this year is once again The Alex. Sutherland Sextet. 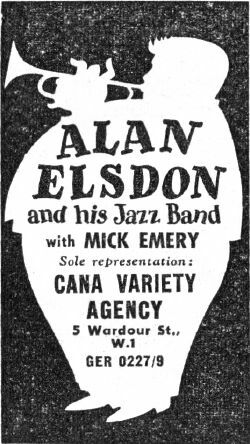 Many newspaper adverts at this time would only list Friday Night as Late Night and Saturday as Palais Night without details of the resident band. 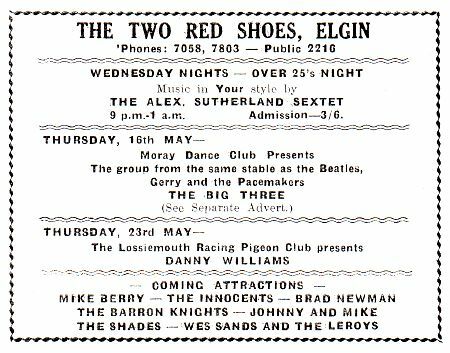 Thursday nights as usual were when the larger touring acts would be featured. 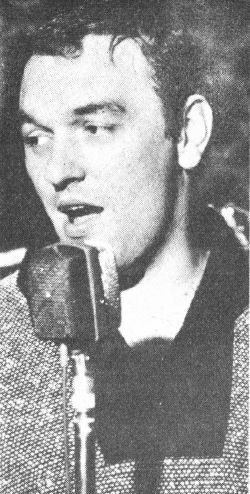 January 23 – Johnny Kidd And The Pirates in the Town Hall. Was there dancing at The Two Red Shoes after? 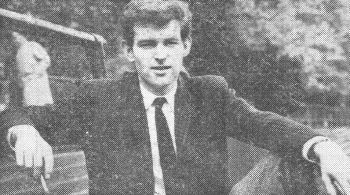 May 07 – Elgin Jazz Club presents the first ever Mod Ball featuring Brian Epstein’s golden boy Tommy Quickly (seen above with “The Wild Side Of Life”) and The Remo Four. June 06 – Melody Maker runs a fascinating article called “The £ S D Of Beat” where the writer puts forward that groups are pricing themselves out of the market and that ballrooms are facing a slump in attendances due to the “over-exposure of groups on TV pop shows”. MM quotes the fee to book The Remo Four for a weekend gig at £ 120. Mid-week slots were always cheaper and this is why I think Albert Bonici had name acts perform on a Thursday. Having promoted myself, I know that it was easy and cheaper to book bands who had a break in their tour between two larger cities. I suspect Albert made it known that he’d offer dates at relatively short notice if he could get acts cheaply enough. 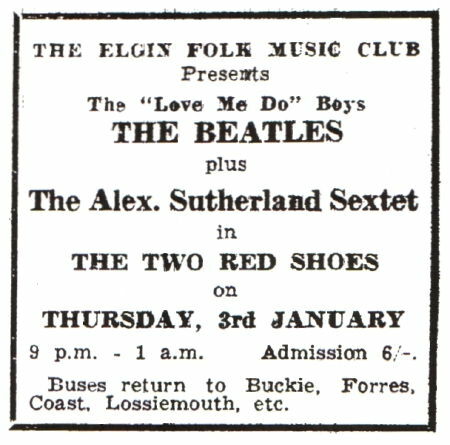 Adverts throughout the years would seem to back this up with a number of bands being advertised in advance but never actually appearing. June 18 – Findhorn Water Ski Club presents Lulu And The Lovers plus The Puppets plus The Alex. Sutherland Sextet. Lulu’s featured above with her top ten hit, “Shout” which entered the chart last month. June 25 – SJP presnts a Mod Ball featuring The Animals. 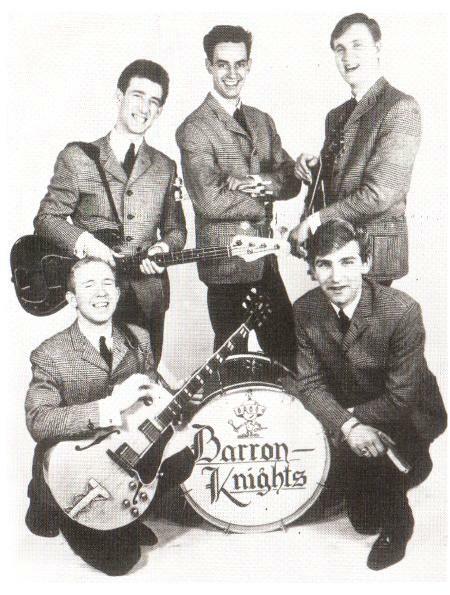 Here they are with their massive hit, “House Of The Rising Sun” which entered the chart today. July 02 – Moray Dance Club presents The Undertakers plus The Alex. Sutherland Sextet. 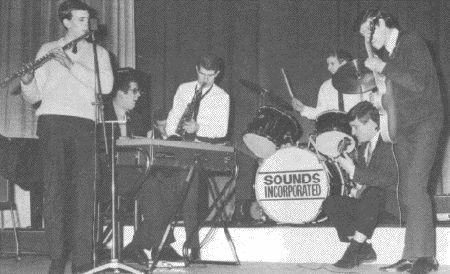 The Undertakers (seen above in an advert for Selmer) were an offshoot of Bob Evans & The Five Shillings which is said to have been Merseyside’s very first rock group. 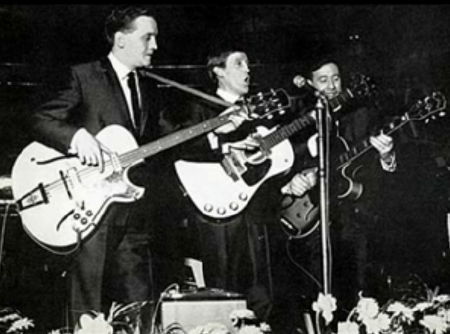 They only existed from February 1961 to December 1964 when they split, partly due to a flu jab paralyzing the arm of saxophonist and vocalist Brian Jones. 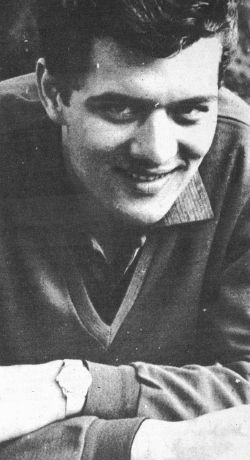 When they played the Two Red Shoes, they featured Jackie Lomax on bass and vocals, who went on to be one of the first releases on The Beatles own record label, Apple. You are currently browsing the archives for the Scottish Pop Music category.